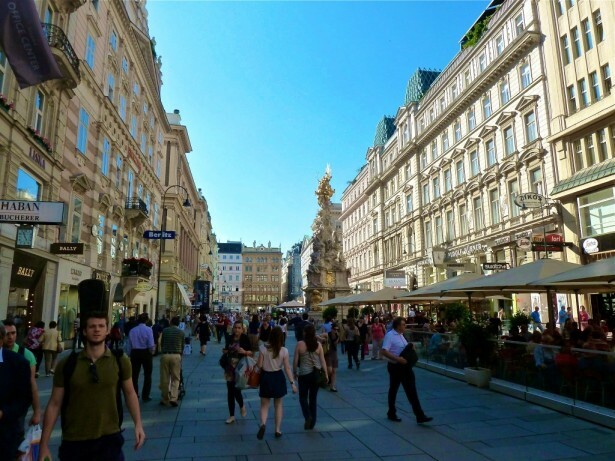 I was recently fortunate enough to have a stopover in Vienna, Austria and although the weather did not fully cooperate for me, I spent a very charming twenty four hours getting to know the city. The city airport train, also known as the CAT is the most convenient and fast way for you to find yourself directly in the middle of Vienna after a long flight. You can purchase your tickets from a small desk or booth in the airport and after making your way downstairs and onto the train, within 15 to 20 minutes you are city centre. Of course if you find it easier there are plenty of taxis and private car transfers waiting to take you to the city or to your hotel depending on what you prefer. One of the great things about Vienna is that there are a number of interesting attractions within walking distance of the city centre. You will find plenty of palace’s and cathedrals to wet your cultural appetite or if you prefer you can simply grab a glass of wine at a small corner cafe and watch the patrons stroll by going about their daily business. 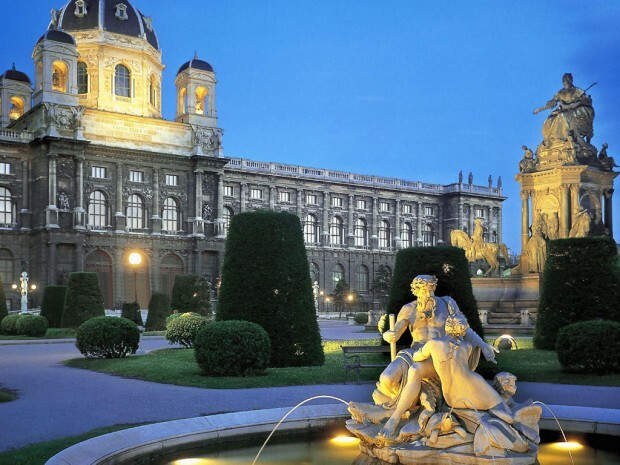 If you are the type of person that gets elated with history and learning about the past lives of a royal nation then you should plan a visit to the Schonbrunn Palace which was once the former summer residence of the imperial family. Of the 1441 rooms that are in the palace, only 40 are open to the public but this is certainly more then enough to give you an outlook into the quirky habits of Austria’s famous family. Because of the popularity of the palace it is not the best place to go if you are attempting to avoid the crowds, especially in the summer, but like I always say, there is clearly a reason that so many people flock to visit so get your ticket early, enjoy the lesson in history and have a bit of patience with the crowds. Vienna has long been a religious centre and the amount of churches and cathedrals are certainly a testament to this fact. St Stephen’s Cathedral is conveniently located directly in the middle of the city and within walking distance of the city airport train terminal. 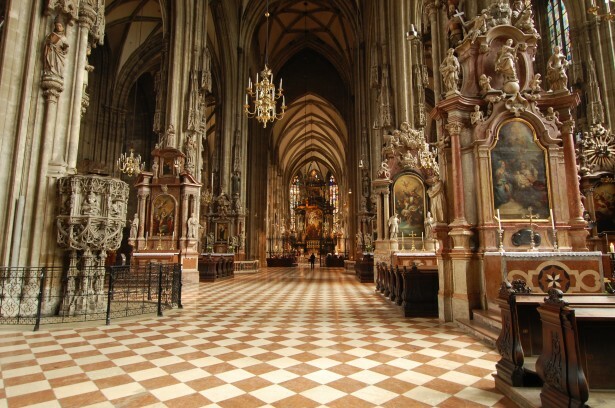 This particular cathedral also happens to be one of Vienna’s oldest churches at around 1000 years old and it welcomes many thousands of visitors and pilgrims every year. The cathedral’s size sets it apart from any other church in Vienna with its impressive spire reaching a height of 136m. It is also possible to climb to the top of this spire, which results in an impressive view of the city of Vienna and a great platform for snapping some memorable photos to bring back home. The fact that entry into the cathedral is free only serves to extinguish any qualms you might have about visiting. Donations are of course accepted and if you prefer to have a guided tour of the facilities then you can pay a small fee to have someone accompany you. If you are visiting Vienna in the summertime and you have just spent your morning visiting palaces and cathedrals, it is only natural that you are now prepared to spend some time relaxing and perhaps even cooling off with a refreshing dip in the newly renovated open-air riverside pool at the Hilton Vienna Danube. Another bonus if you happen to be visiting or staying at this property is that you are nearby Donauinsel (Danube Island) which is famed for it’s bustling bars and restaurants. Danube Island also plays host to the spectacular yearly Danube Island Festival, one of Europe’s largest and most vibrant open-air events where over 3 million visitors flock to listen to over 2,000 artists offering live music. The island festival is also Europe’s largest free party so no need to break the bank in order to take part. During the wintertime in Vienna from January to March, Vienna city hall transforms into a winter wonderland with a 6,000 square meter lit ice-skating area. There are two large ice-skating rinks that are connected by small winding paths throughout the city taking you on a gliding journey under the trees. You will find an assortment of booths lining the ice serving warm tea and punch and plenty of local delicacies to replenish the energy you burnt off during your skate. The rink is open until 10pm and at night the entire square is transformed into a colourful sea of ​​lights, well worth witnessing even if you don’t want to don the skates yourself. Not into activities involving snow and ice? Maybe you have always dreamed about dancing the waltz at one of Vienna’s many famous balls. With hundreds to choose from, the classic Viennese ball has a proud tradition stretching back over four centuries, and has even taken the first steps towards inclusion in the UNESCO Intangible Cultural Heritage List. Every ball is different with some requiring the ladies to wear a mask and others requiring full traditional costume so be sure to do some research before attending so that you are up to date on the traditional ball etiquette. Vienna is also a fantastic place to spend the day strolling the streets, shopping at various stores or nibbling on their famous pastries. 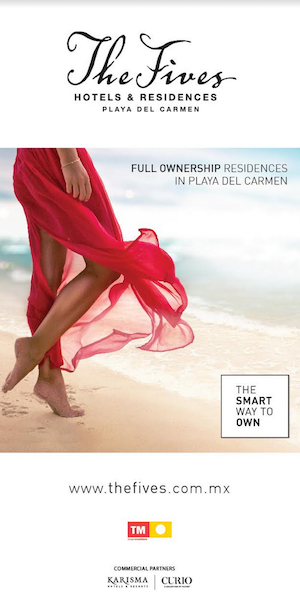 There are plenty of shopping streets that will offer luxury goods at a good value and pedestrian zones to establish an elevated shopping experience. I found the personnel in the stores to be uncharacteristically friendly and more then willing to assist a foreigner so don’t be opposed to ask for assistance in finding that perfect piece of clothing to compliment your increasingly worldly wardrobe. The food in Vienna is not to disappoint and as it is known for it’s pastries and sweets, it serves as the perfect place to indulge in a bit of your sweet tooth. Established in 1928, Altmann &Kuhne located at Graben 30 1010 Wien is a small cozy shop offering every delectable delight imaginable that is everything but good for your waistline. After you have finished admiring the dazzling array of pastries and chocolates in the shop window you can choose your favourite and continue along your much needed jaunt throughout the city. You will also find plenty of small food stalls lining the streets serving wieners and sausages along with freshly baked pretzels. With no shortage of delicious cafe’s and award winning restaurants in Vienna, stopping for a light lunch or a romantic dinner is easy, choosing which restaurant however can prove to be a challenge!